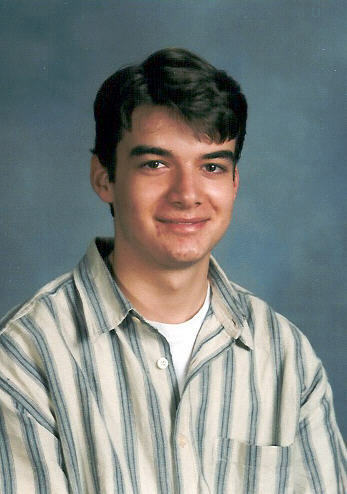 On May 27 1999 seventeen-year-old Justin Nash, along with three friends from the Gardendale church of Christ, was killed by an irresponsible truck driver in a tragic auto wreck as he returned from a trip to Gatlinburg. Josh Beddingfield along with Josh's aunt Connie Beddingfield, and Jeannine Crawford, were also killed. Justin was a very gifted artist. He was especially talented at drawing cartoons and from the time he was very small, he let us know that he wanted to use his art to make people laugh and think. He believed that he would one day be a well known cartoonist. We too, came to believe that God gave him a very special talent, and that he would one day be blessed with "Fame and Fortune". God has plans for each of us, but sometimes His plans do not work out in the ways we imagine. We believe that the good fortune that Justin now has, in the presence of God, is far greater than anything we could have hoped for him in this life. This web site is intended to accomplish three things. We want Justin to be Remembered. We hope to help others who are Grieving. We must make people aware of the dangers in the Trucking Industry. First and foremost we want Justin to be remembered. One of a bereaved parent's most intense desire is that their child not be forgotten. We know that life must go on, but every life has a God given worth and purpose. That purpose needs to be discovered, celebrated, and remembered. The intense grief of loosing a child is difficult to imagine unless you have experienced it. We were helped so much by the resources and experiences of others. Since every experience is different, and offers unique insight, we hope that the things that are posted on this site might help others who are going through a similar experience, or assist someone else in helping them. Lastly, as you will learn on this site, Justin was killed in a wreck with a Semi-Truck. Many different things and people are responsible for the death of our son. It is our hope that by learning about the dangers and short-comings of the Trucking Industry, we might help prevent this from happening again.